That's what we did this past weekend. We made our annual pilgrimage to the woods outside Tyler, TX for the Wildflower Fiber Retreat. The camp we use has cabins with bunks and a large lodge-type building with a big open room and a kitchen. About 50 of us get together to enjoy workshops and down time with our spinning/knitting home-girls. Since the space at Wildflower is limited, I thought I'd give a whirlwind tour of the weekend for those who couldn't be with us. This is barely a taste, but I hope it inspires you to find a way to retreat, wherever you are. 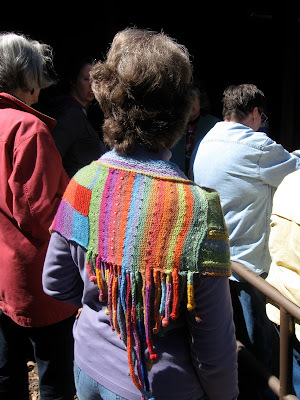 Wildflower Rule: Wear and proudly display items you've knitted and spun since the last retreat. Isn't this shawl gorgeous? I take some of my wares to sell, to offset the cost of enjoying the retreat and to promote the farm. 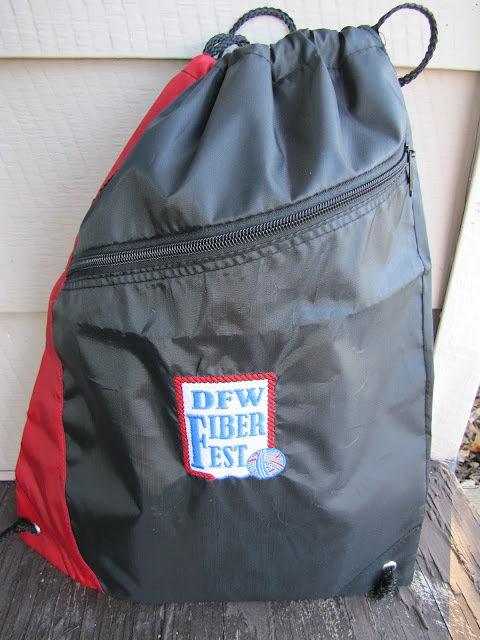 I also swap stuff with other vendors. We take lots of each other's fiber home. I sat in on the spindle class taught by Bev, so that I could pick up any new tips for my own classes. Bev is a great teacher - everyone left with yarn on her spindle! 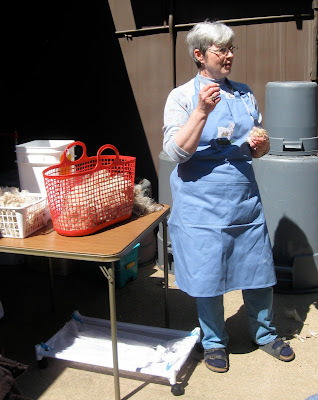 Dori talked about how to clean and prepare mohair for processing and spinning. Dori grows the most beautiful mohair fiber ever, in her flock of angora goats. Here's fellow alpaca gal, Janet, working on the inkle loom. Several were set up for a workshop where participants took home freshly woven bookmarks. The setting, on the pine-studded shores of a peaceful lake, promotes a welcome sense of calm and relaxation. Beautiful weather iced the cake. On Sunday morning, we gathered outside to learn about the fiber-bearing members of the camelid family from Ouijan and Cyndi: vicuna, guanaco, camels, llamas and alpacas. And we got to meet Ouijan's beautiful llama, Bandit. If you weren't with us this year, I hope your situation allows you to consider it next year. Getting out of town is sometimes the only way to make space in your life to learn and grow. Even when you live on a fiber farm.